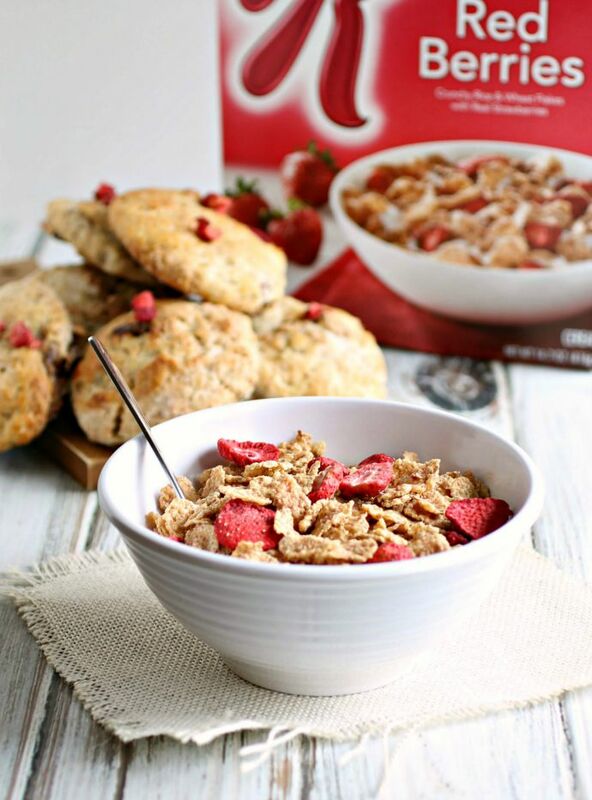 This is a sponsored recipe created by me on behalf of Special K Red Berries. I have a love / hate relationship with breakfast. The part of me that wants something super fast so I can get on with my busy day battles with the part that wants to make sure what I eat is healthy. And that frequently leaves me standing in the cereal aisle on shopping day, endlessly looking at nutrition labels while making sure whatever it is will taste better than the box it comes in. Sometimes I find a winner. I tend to be doubtful about the amount of berries, or whatever, that I'll actually get vs. what's pictured but I was thrilled to find my box of Special K Red Berries was indeed packed with berries. In fact it was a veritable strawberry explosion of aroma and flavor. Yes! The nutrition label passed muster too with a good dose of iron, folic acid and vitamin D. I liked it so much I might have had it for breakfast and an afternoon snack. Ahem. So, what's with the scones? I learned a few years ago that cereal can actually be baked into scones and keep its texture and I've been doing it ever since. 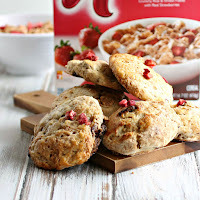 So I added the Special K to my favorite scone recipe and got fabulous, crunch, strawberry filled scones. Can you say new breakfast obsession? Enjoy! In a large bowl combine the flour, sugar, baking powder, baking soda and salt. Cut in the butter using a pastry cutter or fork until the mixture resembles course crumbs. In a separate bowl, combine the egg, buttermilk and vanilla. Pour the wet mixture into the flour and butter mixture and mix thoroughly. Fold in the cereal just until combined. Turn the batter out onto a floured surface and pat into approximately a 1" layer. Use a biscuit cutter (mine is 2 1/2") to cut out rounds and place them on a baking sheet lined with parchment paper. 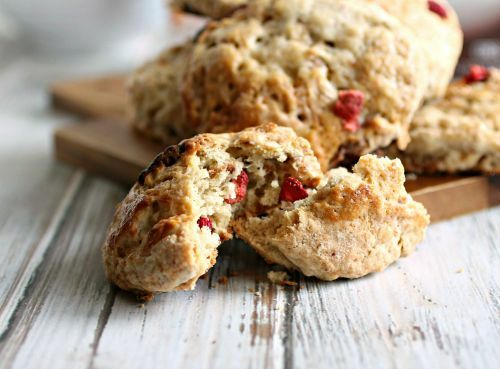 Brush the top of each scone with the tablespoon of cream and sprinkle on the tablespoon of sugar. Bake for 20 - 25 minutes or until the scones are a light golden brown. This is a sponsored post written by me on behalf of Special K Red Berries. 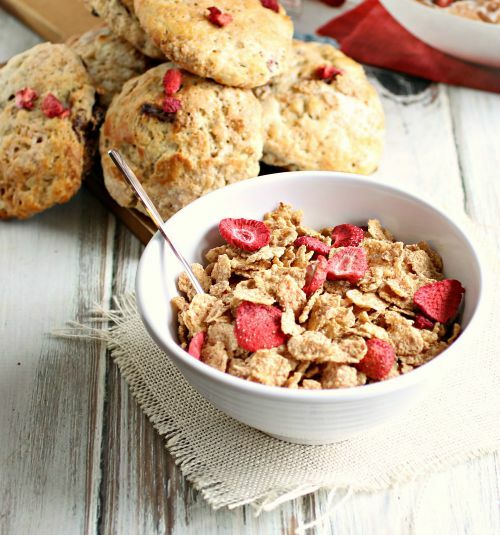 I had no idea you could make scones with cereal - I have some red berry Special K in the cupboard right now - I need to get baking!